What is this miracle food? Colostrum is the first substance created in the mammary glands of all mammals after giving birth. The newborn ingests this important, milk-like food in the first hours of its life before true milk begins to be produced and ingested. For many mammals, including humans, biological compounds that are necessary for the health of a newborn are able to pass through the placenta while the baby is still in the womb. In some animals, like cows for example, the placenta does not allow these substances to pass through to the fetus. For these animals, getting the colostrum soon after birth is crucial. It provides all of the compounds needed to survive and thrive. Milk fat. The milk fat in colostrum is high and carries with it vitamins A, D, E, and K in much higher quantities than found in milk. Immune factors. Colostrum is rich in hormones and proteins that help a newborn fight off infections. These include hormones that stimulate the immune system, cytokines that direct white blood cells, antibodies which go to work in the gastrointestinal tract to kill bacteria and viruses, and several other factors that fight infection. Growth factors. The growth factors in colostrum are proteins and hormones, such as growth hormone, which stimulates the growth of new cells. Insulin-like growth factors are also prevalent in colostrum. These help skin cells grow and develop, regenerate tissues throughout the body, promote blood clotting, and direct the storage of glucose, or blood sugar, as glycogen. Metabolic factors. Colostrum also contains proteins and hormones that direct metabolism. Leptin, for instance, increases the rate of metabolism and suppresses appetite. Insulin in colostrum helps to regulate blood glucose levels. There are also metabolic factors that transport vitamins and minerals, fat-soluble vitamins, and compounds that protect other metabolic factors from being digested and broken down. Lactose. Although colostrum has lactose, which some people cannot digest properly, it contains less than milk does. What are the Health Benefits of Consuming Colostrum? High-quality colostrum collected from cows is a powerful superfood. The presence of so many nutrients in colostrum means that it really can help improve your health in a variety of ways. More and more research leads me to believe colostrum is a must for anyone dealing with a digestive disorder that involves healing the gut. As a bonus, there are no risks or side effects of using it and it tastes great! Leaky gut. Leaky gut is a syndrome characterized by inflammation in the small intestine as well gaps in the mucosal lining. These gaps allow dangerous compounds to get into the bloodstream and cause illness. The immune factors in colostrum can help protect anyone with leaky gut syndrome by attacking viruses, bacteria, and fungi in the intestines. Crohn’s disease and colitis. The antibodies found in colostrum can also help people suffering with either of these inflammatory bowel disorders. The antibodies protect against certain bacteria strains that have been implicated in causing symptoms of the diseases. Respiratory infections. The immune factors in colostrum can help prevent you from getting a cold or the flu. As we age our immune systems become less responsive to invading viruses, but the antibodies in colostrum, along with a healthy lifestyle can restore enough function to fight off these infections before they take hold. Research has even proven that using colostrum can be more effective at preventing the flu than a vaccination. Cardiovascular health. Colostrum can help promote good cardiovascular health in a few ways. It contains no cholesterol and it contains a hormone called leptin. Leptin suppresses appetite and directs the body to use fat for energy. The growth hormones and insulin-like growth factors in colostrum are useful in repairing damage done to heart tissue. Studies have also shown that colostrum helps improve the symptoms of patients with congestive heart failure. Diabetes. Diabetics naturally have less insulin-like growth factor in their bloodstream. Supplementing this hormone by consuming colostrum can help diabetics use glucose more effectively. Colostrum seems to help improve symptoms of both type I and type II diabetes. Autoimmune disorders. Diseases like rheumatoid arthritis or lupus, in which the immune system attacks healthy tissues, are called autoimmune disorders. The biological compounds in colostrum may be able to help people with these disorders by restoring the function of the thymus, a gland that is important in regulating how the immune system works. Food poisoning. Colostrum is not a treatment for being poisoned by food tainted by harmful bacteria, but it can prevent such infections from happening in the first place. The E. Coli, Salmonella, and other bacteria often found in raw meats, and even in fresh produce, can make you very sick and can even cause fatal infections in some cases. Taking supplemental colostrum, however, has been shown to help protect against such infections, thanks to the antibodies present in it. The best defense is colostrum combined with good food hygiene practices. Athletic performance. Athletes can benefit from using colostrum during training. Taking colostrum has been seen to improve several performance measures for athletes, including overall energy recovery after training, muscle recovery, and stamina. AIDS. Patients with AIDS have severely hampered immune systems and struggle to fight off infections of any kind. Studies have shown that supplementation with colostrum helps to prevent opportunistic infections, such as a cold or the flu, in AIDS patients. Colostrum has also helped relieve diarrhea and muscle wasting in people with AIDS. Colostrum can be viewed as a dietary supplement, but it is really a food. There are no side effects, and the only potential, though small, risk is for people who are lactose intolerant. Even if you do have lactose intolerance, you may be able to take colostrum, as the quantities of lactose are low, considerably lower than in milk. Try some in a small amount if you are lactose intolerant to see if you can digest it without symptoms. Dietary colostrum comes from cows and is sometimes called bovine colostrum. True, high-quality colostrum comes from the milking done within the first six to eight hours after a calf is born. What comes after that is milk. Not all producers of colostrum adhere to that strict rule, so there are products labeled as colostrum that may really be milk. Unless you have your own cows you probably won’t be able to get fresh, raw colostrum straight from the source. That doesn’t mean you can’t get good quality colostrum. 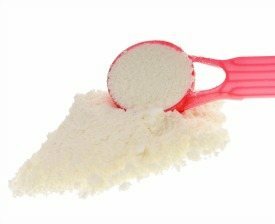 The most common form in which you will find colostrum is powdered or in capsules. Look for product that comes from pasture-fed cows free of pesticides and hormones. Also look for complete colostrum. Some products are marketed as having fat removed for better shelf life. To get the most benefit you want colostrum that has been minimally processed with all those healthy fats intact. There is one aspect of this processed colostrum that makes it better for you than a fresh raw sample. The latter would come from just one cow, while processed product is a mixture of colostrum from many cows. This gives you a better assortment of all the biological factors from the various individuals. And if you’re worried about the calves, don’t be. They always get the first few hours of colostrum from their mothers. Powdered colostrum is a great ingredient for pretty much any smoothie recipe. It’s particularly awesome in elixirs and lends a rich creaminess that’s to die for. As with any new food or supplement you’re introducing into your diet start small, a teaspoon, and work your way up to as much as two heaping tablespoons. Colostrum will add a creamy taste that works with almost any smoothie flavors. Get creative and try this superfood in all your smoothie and elixir recipes. At the time of publishing this article I don’t have any smoothie or elixir recipes that call for colostrum. Don’t let that prevent you from trying this truly super food. As I mentioned above, you can add it to any smoothie and experience its myriad health benefits. I’ve only found one viable source of this wonderful superfood, Surthrival. Their colostrum is available in several different sizes. The larger size bags are expensive, but they last a long time. Click here to try this amazing food for yourself. What’s your experience with colostrum? Do you consume it regularly like me, and if so, what health benefits have you noticed? Let me know in the comments below. Yes I have been taking it daily for the past 4 years. I get one serving in my daily packet of LIMU Z6, then I purchase a kilo every month from Dock of Health, now called annovite. Surthrival actually purchases all of their colostrum directly from Dr. Anthony Kline Smith (Dock of Health) and I am a wholeseller and it is almost half the price of Vitalis. I am about to be 36 next week, and everybody says I look about 21. I was wondering if people that are lactose intolerant like I am can use colostrum in their smoothies without any problems? Most people who are lactose intolerant can consume colostrum without issues, Kim. Give it a try and see how you respond. Hi,where can I buy the colostrum powder here in Edmonton?can it be put in any of your smoothies?what do you recommend the colostrum powder be used in your smoothies? Yes, you can add right into any of your smoothies. I find it blends well with all recipes. Hi,thank you for replying to my question about colostrum.I will give it a try in my smoothies as soon as I know where I can buy a bottle of colostrum.where can I buy this bottle of colostrum in Edmonton? If they don’t ship to Edmonton, I’d check your local health food stores. Hi,I haven’t tried the colostrum smoothie yet and I will go to the health store asap to see if they have the colostrum powder and if they have it I will buy it and try it in a smoothie soon,and I will let you know soon. Hi,some day in the near future I will buy a container of colostrum powder or capsils but there is a problem with the company and regulations shipping to Canada. Hi,I just found a container of colostrum powder at vitamart in the town I live in and it is called sequence colostrum and this store sells it for $42.97,so now I can go to this store this month and buy it and then start using it in your smoothie with the ingredients that I am going to buy soon. Nice to hear you were able to find colostrum, Kim. Enjoy! Hi,when I do buy the container of colostrum powder from this store soon,how much of it should I put in your smoothie.should I gradually add a certain amount of the powder to the smoothie then drink it with a straw. What smoothie recipe can I add the colostrum powder to it before I drink it? I am going to try the peanut butter chocolate smoothie soon but I don’t have vanilla extract in the kitchen. Start with half the recommended serving size for the brand you buy. Work up to the recommended serving size after 2-3 smoothies. Always wise to ease into new foods. You can add colostrum to pretty much any smoothie. I really like it with chocolate smoothies. Hi,I was at the vitality store in one of the malls in Edmonton and one of the staff is going to see if the owner can order some cans of the colostrum powder for me to buy so that I can put in my smoothies.Ii saw a bottle of colostrum in pill firm butI didn’t want the powder in the pill but inky in powder in a can. If the owner can order some cans in the vitality store I will buy a can of the colostrum soon to put it in my smoothies that I get from your website. I will let you know soon when I start using the colostrum powder and other ingredients to put in my healthy smoothies as soon as I make them in my blender.your website is awesome. Sounds good, Kim. Hope you can get the colostrum powder soon. Hi Ryan, I’m really interested in this! I’m about to join your website and going to order some colostrum. Do you have any other ideas? May be silly question but could I add it to my raw milk in coffee? Thanks and Best Wishes, Janet. I find that colostrum goes well in pretty much everything, Janet. I think it would taste great in raw milk and coffee. Let me know how it turns out. So glad to have found this post. Im currently in Benin, West Africa. I could easily access colostrum naturally from pasture fed cows but I’m concerned about preservation (I don’t have a fridge) and also nervous in general about just consuming it directly without any kind cleansing process. I don’t have experience harvesting colostrum. There must a be a local familiar with the process that could show you. You can consume like milk and will apparently have to consume quickly if refrigeration is not an option.